Beachfront! Private Beach, 3 acre, 3 Bed/Bath Suites 2 on 2nd floor, 1 on 1st. 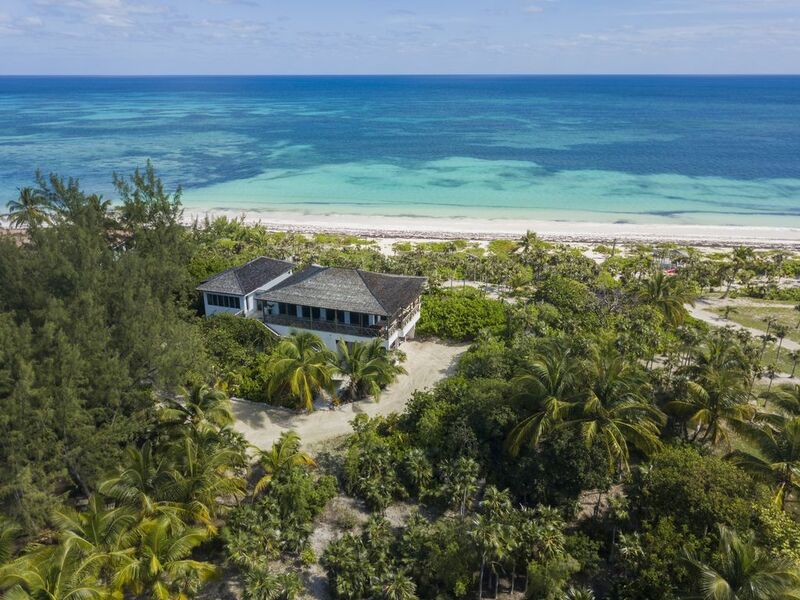 Luxury beachfront home, directly on a pristine pink sand beach on an exclusive private island! Enjoy 3 acres of lush tropical landscaping with Coconut Palms, Hibiscus, Sea Grape, Sea Lillies, and Bougainvillea to name but a few. The 22' elevation from the 2nd floor, provides stunning panoramic views of the Atlantic Ocean and Savannah Sound from every room. Enjoy the best of both worlds; the ocean right in your back garden (literally) or Sound in the front garden! Snorkel the reef, teaming with tropical fish and lobster, or Kayak and fish the Bonefish Flats! Our newer private dock will allow easy access to this incredible eco system. Observe Dolphins, Mangrove Snapper, Turtles and giant orange Starfish! Cool tropical breezes can be enjoyed throughout the house with wall to wall glass sliding walls/doors. For those warmer summer nights, the entire house has central air conditioning (2 separate central air units). Enjoy the fully equipped hand crafted Island kitchen, or inquire about catering services/personal local cook or Gourmet chef (additional cost). Guests will have a mid stay ‘freshen up’ during their stay. Please advise if additional housekeeping is required. Smart House & lights (LED), Nest (thermostat & doorbell/security camera. Google Assistant throughout the house, both levels. Enhanced Google WiFi, High speed DSL, free unlimited US & UK phone calls. Bluetooth compatible sound system in the great room. Propane BBQ (charcoal upon request), DVDs, BluRays. Windermere Island is a safe, secluded, private, gated islet on the Atlantic Ocean, where the sunrises and sunsets are spectacular. One of the safest, most beautiful places on the planet. The crystal clear water is perfect for swimming, kayaking, shelling, snorkeling, diving, boating and fishing. Relax on one of the worlds' most beautiful beaches, right in the back garden! This powder fine, pink sand beach remains deserted apart from the occasional neighbor passing by. This beautiful, unspoiled natural paradise remains one of the worlds best kept secrets!! We also have 3 Kayaks, 2 Stand Up Paddle Boards, a Surfboard, 6 new Giant Bicycles (high-quality aluminum), and numerous fishing rods, for your enjoyment. Also the option for even more water fun with a 12ft Skiff/boat (additional cost) on our boat ramp! Come and enjoy paradise for yourself! The Main house at Ocean Daze (3,600 sq. ft. under roof, 1,800 sq. ft. of A/C & 1,800 sq. ft. of balcony); is a 2 story building at a 22' elevation and provides stunning panoramic views of the Atlantic Ocean to the east and Savannah Sound to the west. It boasts 3 glorious acres of lush tropical foliage with the spectacular Atlantic Ocean in the back garden and serene protected waters of Savannah Sound in the front garden. The property comprises (on the 2nd floor); 2 Main Bedroom Suites; the Sunrise Suite has 1 King bed and ensuite bathroom and a delightful rain shower with ocean views. Beyond the rain shower is an outdoor shower overlooking the ocean. The Sunset Suite has 2 Queen beds that sleeps a total of 4 guests. The main house, 2nd floor sleeps 6 comfortably. Main House, Pirates Den, 350 sq. ft., located on the first floor, directly beneath the Sunset Room, is the Pirates Den Bedroom/Home Theatre/'man cave'. It is accessed via a separate entrance, and comprises a private area perfect for a break from the sun or for watching family movies on a 65" screen with Bose CineMate GS Series II, sound system. The Pirate's Den is also the perfect place for extended family or older children wanting their own space, as it's self contained, yet a part of the main house and sleeps up to 2 guests. It comprises a cozy bedroom, with 2 twin beds, (which can be converted to a King bed) ensuite bathroom and a separate living area, with a very comfy oversized L shaped sofa. This self contained hideout also has its own kitchenette complete with fridge/freezer, water cooler and every appliance necessary. There are lush tropical garden views with cascading Bougainvillea, Seagrape Trees and Coconut Palms from the 8ft glass entrance door. Up to 8 guests may be accommodated, please inquire. Bonefish Cottage (additional charges will apply) 550 sq. ft., consists of 2 bedrooms and 1 separate bathroom (with shower and soaking tub). Bonefish Cottage, our newest addition, is built on pilings at a 12' elevation to provide magnificent panoramic views of Savannah Sound and the Bonefish Flats. This totally separate, secluded, private cottage is in the front garden, on the west side of Ocean Daze Estate. It is close to our newer 70' dock on Savannah Sound. This cozy cottage will accommodate up to 4 guests, in 2 bedrooms with separate bathroom. There is an open plan Island-style kitchen and main living area with a trundle/day bed. The handcrafted island kitchen, is compact, though fully equipped, with stunning water views of the Sound. Enjoy the glorious, sunsets from your front deck. Breathtaking views can be enjoyed from every room in the house, through the oversized glass windows and doors. A fisherman’s dream! Descend the staircase and head straight to our newer dock to meet your Bonefish Guide! Watch Dolphins playing in the crystal clear waters. Paradise awaits! Power and water are precious commodities in the islands. Please note at Ocean Daze Estate we are Eco-friendly. In the event that the island water goes down, we have a back up water cistern that will supply water for all your needs. We have installed a new commercial quality, whole house, back-up generator that will start up automatically with any power disruption. This will ensure that your vacation experience is the best possible, in the event that the island power supply is interrupted. My husband and I spent five years designing and building Ocean Daze, our dream island home. It is our lives ambition realized! This totally unique, multi-million dollar villa, sits on top of a 22ft. elevation, boasting panoramic views of the sparkling, crystal clear Atlantic Ocean in the back garden and lush, calm waters of Savannah Sound, protected Lagoon, world renowned Bonefishing flats in the front garden. We discovered Eleuthera about 14 years ago. We had no idea that anything like this existed and just a one hour flight from the US. It is a totally unspoiled, uncommercialized island and it was 'love at first sight'. There are rolling hills, and lush tropical foliage throughout the island which is surrounded by the most incredibly beautiful, crystal clear, azure waters of the Atlantic Ocean. Historic settlements and friendly locals add to the flavor of this truly unique island experience. Windermere Island is a totally private, exclusive island. We have a security guard 24/7 to ensure that you are totally safe and will remain undisturbed throughout your time at Ocean Daze island retreat! Definitely something that our high profile celebrity and royal guests appreciate. The powder fine, pink sand beach is literally in our back garden. Beyond this is the crystal clear, azure waters of the Atlantic Ocean. We even have our own reef to the north side of our property. Spend your time relaxing on the beach in your own back garden, where the only footprints you see, will probably be your own. You can also explore the front garden, Savannah Sound, with it's world class Bone Fishing flats. Make our 'slice of paradise' your 'island home, away from home'. Come and enjoy this gorgeous, spacious, luxury villa and make it your island retreat! Unique master bathroom has stunning ocean views. Step out of this bathroom shower and into the outdoor hot/cold shower to enjoy the night sky lit with billions of brilliant stars. There is no light pollution on this natural unspoiled island! Beautiful carved wood vanity has porcelain sink and granite top. 2nd en suite bathroom/guest bathroom has an over sized shower and lots of room also. Beautiful carved wood vanity has porcelain sink and granite top. As mentioned, the 3rd shower is outside under the sun or the stars. Wash your cares away! Private pink sand beach - right in our back garden! Take a look at the satellite image of our property!! Ocean Daze is literally situated on one of the most beautiful powder fine, pink sand beaches! It truly is one of the worlds' best kept secrets!!! Located directly on a magnificently beautiful pink sand beach. In addition to being directly on the ocean, Ocean Daze is also on Savannah Sound. The property spans both the ocean and sound. We have a dock, which is great for fishing or launching your kayak. Two separate central AC units cool our island home. A dedicated unit for the bedrooms and another for the Great Room. Separate mini split AC for the Pirate's Den/Studio/Man Cave/Home Theatre. Luxury, hyper allergenic bed linens for your added comfort! Located on the 1st floor of Ocean Daze. Set of indoor dinnerware. Set of outdoor melamine dinnerware. Hand crafted Island kitchen made by local artisans. Stunning panoramic views of the Atlantic Ocean in the back garden and Savannah Sound (protected lagoon) in the front garden. Smart TV in each room. Apple TV in the Great Room. Blu Ray Player located in both bedrooms, Great Room and Pirate's Den. Many books and magazines. A wide variety of both fiction and non-fiction. Also fun and informative children's books. Stream your favorite songs through our WiFi or Bluetooth to our house speakers. Beach toys galore! 3 - Ocean kayaks, 2- Paddle Boards, Body board, fishing rods & tackle, etc. 6 - Bicycles for exploring the island. Great selection of DVD's & Blu-Ray's from all genres. Three acres of lush tropical gardens with the Atlantic Ocean in the back garden and Savannah Sound in the front garden. Nature Trail, lots to explore!!! Huge wrap around balconies on 3 sides of the house with lots of cozy seating areas for everyone. Ocean breezes galore to the east and spectacular panoramic views of the ocean and sound. 3 Ocean kayaks, 2 Paddle boards. Masks, Fins & snorkels available. Fishing gear - rods, tackle & bait. Options are available through a local boat rental company. Further details can be provided. Catch the balmy ocean breezes on the back porch! Huge Sun deck overlooking the Atlantic Ocean. Great for tanning or star gazing! Surfboard, Boogie board, available upon request. Private 'Har court' Tennis Courts available for our guests. Brand new Tiger Woods Golf Course opening in 2019. Just a short drive away. I personally, will assist you with any questions that you may have. I can also arrange for any local activities to enhance your vacation experience - car rental, boat rental, fishing trips, diving/snorkeling lessons, professional sight seeing tour, therapeutic massage with our licensed massage therapist etc. You can enjoy the beautiful hand - crafted gourmet kitchen and all of it's modern conveniences, or sit back and relax and have an island meal delivered to your dining table (additional cost). Management/owner may be onsite. Ocean Daze.........a beautiful, newer vacation home with stunning Saturnia marble floors throughout and endless panoramic views of the Atlantic Ocean and Savannah Sound from every room. This elegant island villa has 1800 sq ft of air conditioned space and 1,800 sq ft of exterior covered living area. Your escape from the 'rat race' is on the exclusive, private, Windermere Island. It is accessed from the island of Eleuthera via a gated bridge. You will probably find that your footprints are the only ones on the beach! If you happen to see another car along the Queens Highway (the one main road on this 110 mile long island) the driver is sure to give you a friendly island wave! This is true island life - paradise found! Other Activities: escape from the rat race!!! stroll/jog the miles of secluded beaches, photograph the incredible beauty, total privacy and unspoiled beauty, snorkel, dive, Bone fishing, Ocean fishing, boating. Panoramic views of crystal clear ocean/ pink sand beach, and Savannah Sound from every room in the house!